I really enjoy making something that I know someone will love to receive. There’s nothing worse (well I’m sure there is!) than spending time making something and when you give it to the recipient, you’re not really sure you should’ve even bothered! 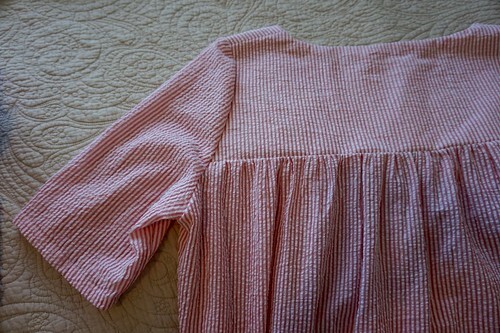 My mom always loves what I make for her, so I decided to make her a nightgown she could take with her on vacation! I used Butterick 6838 because it has that cute and comfortable look she usually wears. She really likes seersucker, so my daughter picked out a nice red and white striped seersucker fabric at our local shop. When I washed it, it shrank A LOT! 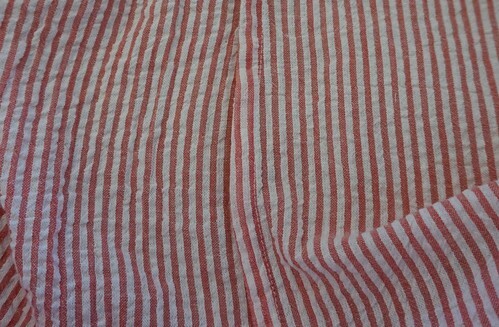 I almost didn’t have the width I needed for the bottom of the nightgown! I used French seams on the sides. I figured this would keep the inside nice and soft. I used a stashed fabric for the yoke lining since I ran out of seersucker. I like the contrast! I did change the directions of the pattern a bit when attaching the yoke lining. Instead of pressing under and hand stitching, I pressed it out along with the seam allowance for the front and back yokes, and sewed those seams together, then I just serged the seam to finish. You can see it at the bottom of the above pic. 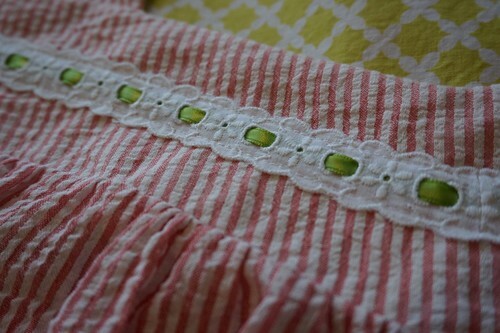 I also had some eyelet trim with cute embroidered flowers and green ribbon that matched the yoke lining on hand. My mom likes things very simple, so I was a little concerned she would think this was too busy, but I think it breaks up the seersucker. Here’s the back view. Very simple. She also wanted 3/4 length sleeves, so I shortened them using my own arms as a guide. When looking at the back, I had originally wanted to have the stripes face horizontally on the front and back yokes, but I just couldn’t squeeze it out of the yardage I had. I even bought an extra yard, it shrank that much! This was very easy to sew together. 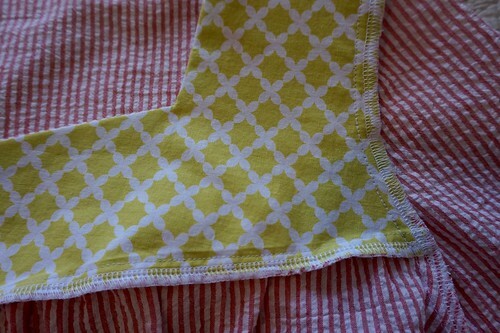 This was my first time using eyelet trim the way it was intended, and I loved the way it turned out! I think it’s a bit big on my mom though, but she likes her pj’s to be loose, so it’s probably alright. Anyone getting ready for holiday gifts already? 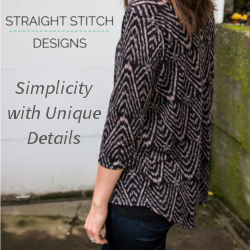 Any patterns you know you’re going to be using? Please share! Thanks! I hope my mom thought so too!! !